2018 U.S. Open: How histori are Brooks Koepka's consecutive U.S. Open victories? 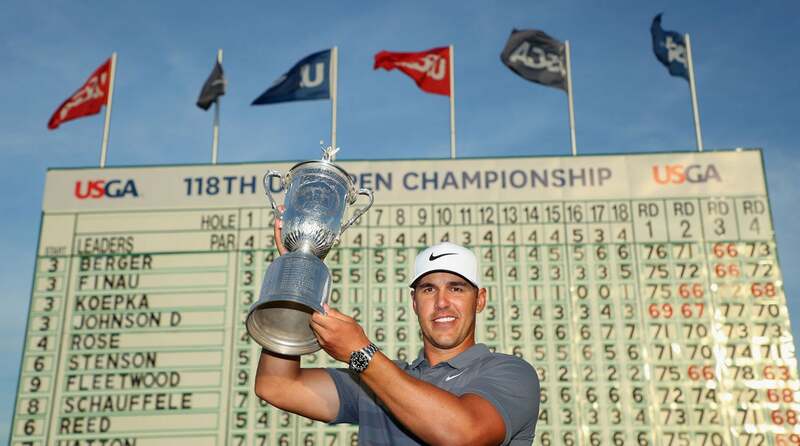 Tour Confidential: How historic are Brooks Koepka’s consecutive U.S. Open victories? Check in every Sunday night for the unfiltered opinions of our writers and editors and join the conversation by tweeting us @golf_com. 1. Brooks Koepka repeated at the U.S. Open, coming from the penultimate group to shoot 68 and top Tommy Fleetwood, who shot 63 earlier in the day to take the clubhouse lead, by one. The 28-year-old has won three times on the PGA Tour, and two are majors. He becomes the 16th player to win two U.S. Opens, a list that includes several Hall of Famers. He’s also the first to win back-to-back Opens since Curtis Strange did it in 1988 and '89. What about Koepka's game jives so well with the unique demands of the Open? Michael Bamberger, senior writer: Nothing. Good golf is good golf anywhere, and at anytime. Alan Shipnuck, senior writer (@alanshipnuck): He drives it long and straight, is a precise iron player, has a feathery touch with his wedges and makes clutch putts. That’ll do. Josh Sens, writer: Koepka has all the physical tools. A lot of guys on Tour have all the physical tools. What was notable this week (aside from the big drives and the clutch putts) was his mental state. He said he was the most confident guy in the field. That's not something you can fake. Sean Zak, assistant editor (@sean_zak): The fact that he does everything really, really well. Some players have flaws. Brooks has none. Jess Marksbury, associate editor (@jess_marksbury): Koepka had the benefit of being under the radar for the first two rounds, and was able to quietly grind his way up the leaderboard without a huge amount of fanfare until the second half of the championship. As Josh mentioned, he's confident, and his hot start certainly helped, with three birdies in his first five holes today. He has that "ice in his veins" quality under pressure, and based on the display we witnessed today, there are more majors in this guy's future. Alan Bastable, executive editor (@alan_bastable): His bouncebackability. Dude doesn't dwell, which is huge — nay, essential — at the U.S. Open. You're going to miss fairways, run chips (and maybe putts) off greens, and three-or four-putt. The players, like Brooks, who can manage their disappointment and frustration have the best chance to thrive. Of course, that missile launcher he carries in his bag doesn't hurt, either. Jeff Ritter, digital development editor (@jeff_ritter): He had a few chances to crack on the back nine but held it together. On 11, the brutal par 3, his tee shot went over the green and down the bank, and that spot is d-e-a-d. But he canned an 12-footer for bogey when he could've easily made double or worse and said afterward that stealing that shot gave him the confidence the rest of the way. Ride the wave, man. Dylan Dethier, associate editor (@dylan_dethier): Mental toughness. Ritter mentioned that eight-footer for bogey at 11 — that thing was slammed off the back of the cup. Joe Passov, travel and courses editor (@joepassov): He has all the tools, mental and physical, with an asterisk on the physical, given all the injuries he's endured. That has let him come in under the radar and has shown by all the 63s he's posted in recent weeks, he should have been taken more seriously as a contender. Once he got in the hunt, he could call on what it all felt like just one year ago to seal the deal. 2. Put into historical perspective what it means for a player to win consecutive U.S. Opens. Bamberger: Curtis said, "Move over, Ben." Curtis Strange. Ben Hogan. This guy. He should feel very proud of himself. He never has to do another thing in the game, though he likely will. Shipnuck: It means Koepka is already a player of historical importance. The Masters is more glamorous, the Open Championship more freewheeling fun, but the U.S. Open remains the most important tournament in the world. Sens: It's been done seven times in the history of the game, and the last time was 30 years ago. This is rare stuff. Not Comet Kohoutek rare but so scarce that most of us on this forum will likely not see it again. Zak: Woods and Nicklaus are among the many who never pulled off back-to-back Opens. Is there a more difficult tournament in the world to defend a title at? There can't be. It's an incredible accomplishment. Marksbury: I'm still getting over the fact that he's only won ONE other time on the PGA Tour. ONE?! And now back-to-back U.S. Opens? It's truly amazing. He'll never be a major championship dark horse again. Bastable: Tiger, Jack, Arnold, Snead, Player, Watson, Nelson, Watson, Player, Trevino, Sarazen, Miller, Floyd, Norman, Casper…not one of them did it. Ritter: It's a tremendous accomplishment, and it's amazing that Brooks has only one other Tour win. But I think he's going to finish ahead of Andy North — no disrespect to the pride of Thorpe, Wisc., who also won two Opens and just one other event. Dethier: We're in an era with more great competitive golfers than ever, and the U.S. Open is the most demanding, unpredictable major of the four. It's hugely impressive. Passov: A monster achievement by any standards or era. Yes, the Andy North comparison, odd but true, doesn't bode particularly well, but in truth, he's one of the game's best players and if healthy, he'll validate this Open titles with many more Ws. Wood: Last year’s performance at Erin Hills was incredible, and nothing can be taken away from that. He played better than anyone else, and that U.S. Open medal looks like all the others. However, I think a lot of people maybe didn’t value it as a true U.S. Open win. The fairways were massive, winds were calm, and the greens were soft. It was strictly a bombers paradise, and in my life maybe the only U.S. Open held in which fear wasn’t a major factor for the players. To have him validate that win with a win this year on a golf course that was beyond scary at times, and felt like a true, classic U.S. Open where every par felt like a victory, was huge. At Erin Hills, 31 players finished under par. At Shinnecock, zero players finished under par. To win two U.S. Opens as disparate as the last two is maybe more impressive than any other repeat in history. 3. Koepka won, but the championship will also be remembered for Phil Mickelson's 13th-green fiasco on Saturday, when he was penalized two strokes for intentionally hitting a moving ball. Mickelson said he was merely using the rules to his advantage (he later said it "wasn't my finest moment"), but critics thought his actions were an abuse of the rules and a slap in the face to the game’s traditions. How much, if at all, will this episode damage Mickelson's reputation? Bamberger: Over the long term, it's a blip. But as a window into how he thinks (or doesn't) it was extraordinary. Sens: I'm with Michael. Long term, it's blip. To his most ardent fans, it actually almost dovetails with what they like about him. A kind of swagger and self-assuredness that can verge on self-destructiveness but is something of a spectacle either way. Personally, I thought it was lame, and that he should have been DQ'd. But it's professional golf. It's entertainment. I have a hard time getting worked up enough about it to see it as a thumb in the nose of any grand tradition or any of that hoo-ha. Are the majority of golf fans going to dwell on this one? I don't think so. Shipnuck: I don't know, it hijacked the U.S. Open for a good 24 hours. It really just confirms what we already knew: Phil always wants to be the most clever guy in the room. This time he outsmarted himself. Zak: For every weird Phil moment like this, or the 2014 Ryder Cup press conference, there are 50 entertaining Phil moments that are free from consequence. We'll definitely remember this one, but it'll fade from memory...until the USGA enacts a Phil Rule next year. Marksbury: Agree, guys. It will be a fun highlight to re-run at every U.S. Open for the rest of time (and maybe even in between). But I doubt it will do any lasting damage. Phil's fans are with him for the long haul. Bastable: Among his rabid fan base, yeah, this won't register. They'd jump in front of a Brooks Koepka tee shot for Phil. In the halls of Far Hills, severely. Although as Bamberger's excellent reporting this week points out, agitating the USGA might well have been the mission of Mickelson's petulant protest. Safe to say he won't be getting a holiday card from Mike Davis. Ritter: And Mike Davis won't be receiving one from Phil. I thought Phil should've been DQ'd, but the rule the USGA chose to apply kept him around through Sunday. I do wonder if we can now safely close the book on Phil ever winning one of these and completing the career slam. His fans will forget this incident, but karma remembers forever. Dethier: He should have been DQ'd. I think this will go alongside the other things that people joke about with regards to Phil, the risk-taking gambler side to the man. Michael has done a good job exploring what else it may tell us about Phil, but this ultimately gets laughed off by the majority of golf fans, and I'm okay with that. Passov: Even if I do feel he violated the spirit of the competitive game, I don't know that he should have been DQ'd for breaking the rule as applied. However, if that rule allows for this kind of conduct, it's a bad rule and should be changed. What won't change is how his fans, both serious and casual, think of him. After all of John Daly's bizarro transgressions, his base remained with him throughout. Same with Phil. With that smile, his charity work, his marathon autograph sessions and his go-for-broke playing style, he'll be just fine. 4. While the first 36 holes of the U.S. Open were relatively uneventful, the course conditions became a storyline on Saturday, just as they did at Shinnecock in 2004. Zach Johnson, Ian Poulter and several other players criticized the course and the USGA. "Frankly, we just missed it with the wind," USGA chief Mike Davis said. "It blew harder than we thought." The USGA, fairly or not, has now been criticized for its setups at three of the last four U.S. Opens (and the other, at Oakmont, was marred by a messy rules controversy). Why has is it proven so hard for the USGA to get the U.S. Open "right?" Bamberger: They did get it right. The USGA has nothing to apologize for. It was tough and fair and golf is an outdoor game played in unpredictable conditions on an ever-changing field. As Phil would say, time to "toughen up." Whatever that means. Shipnuck: Golf courses are living, breathing things. It's not easy to bend them to your will. The bitter irony is that this is really about the USGA's incompetence in regulating distance gains. The pros will shred any course unless it is pushed to the absolute limit. When you do that, things can go wrong. Sens: A few goofy pins on Saturday but I'm with Michael once again. It's the US Open. It's supposed to be very hard. Look at the top page of the leaderboard. Do those results look fluky? Dethier: Preach it, fellas!! I think the only place they've gone wrong is in appearing to play God with the setup — they've made themselves easy targets for criticism, even when little is warranted. Zak: I'm convinced it's near impossible to battle against technology, keep the winning/leading score near par, and not bastardize the course in some ways. That's why it's hard. The USGA seems comfortable hanging out near the edge of a mountain. Sometimes they get blown over the edge. As long as they're comfortable there, they'll be derided by some folks for not "getting it right." Marksbury: I don't know why the USGA felt the need to apologize, and even take the drastic step of making changes to the course on Sunday. It's supposed to be "golf's ultimate test!" "Hard" should equal "getting it right." Bastable: Biggest issue was how differently the course played Saturday morning v. Saturday afternoon. Late wave got crushed. They were playing a different golf course. Last 10 players to go off shot a combined 56 over par. I spoke to Henrik Stenson Sunday evening. He was still chapped about it. Ritter: It's tough to set a course near the edge without going over it. But this is the U.S. Open's identity — it's supposed to be brutal. Maybe unfair at times. It would never work to have 30 events like this per year, but for this one major, players who want to contend just have to accept it. I didn't hear Koepka complain once all week. Go figure. Passov: I'm not jumping on this edge-of-the-cliff bandwagon. There's hard-fair, as in the case of Winged Foot in 2006 and Oakmont in 2007, where five over was the winning score. And then there's hard-stupid, where skill and luck trade places, and that's what happened here at Shinny — but only on a few holes on Saturday. The U.S. Open should be the toughest test the guys face all year, mental and physical, but we need to stop taking setups "to the edge" and then getting burned by the weather. Just find a great course — and I think Shinnecock is the greatest Open test of all — and let them play. Wood: The issue I have is why does this only seem to happen at U.S. Opens? Other than Tiger’s hitting the flag on 15 and taking an incorrect drop at the Masters a few years ago, can anyone remember a rules fiasco or a course setup argument at any of the other majors, or the Player’s Championship? At Chambers Bay we played a U.S. Open in which you couldn’t tell where a green started unless you saw the painted pink dots along the ground, you had par change on one hole from a 5 to a 4 and back again, and you had a national championship in which several of the greens had grass on them, and many basically didn’t, but the USGA kept insisting that the course was right where they wanted it. At Oakmont, you had the leader’s ball move on a green, which was caused by wind and 15 stimp greens, not by anything he did, and had the rules official give him a ruling on the spot, only to be overruled by other officials who reviewed it on TV, making him play the last 12 holes or so not knowing what he was shooting. Not only did he not know, but the other players and the viewers at home didn’t know either. As the great Liz Lemon might say: “What the what?” Last year at Erin Hills, the course was set up with a single defense, wind. When the winds didn’t blow, the course was left defenseless, especially by someone who could drive it 330. You had 31 guys finish under par at a U.S. Open. “What the What?” And this year, you had the ridiculousness which was Saturday, which produced a leader group on Sunday who started Saturday 11 shots back of the lead. So back to my original point...why does this controversy always seem to happen at a U.S. Open but no where else? I’m with Rory on this one. Keep it simple, don’t overthink yourself and try and reinvent tournament golf. I won’t divulge any names, but on the 1st hole of most U.S. Opens, a rules official will come up to us caddies and sometimes very condescendingly say “Make sure you’ve got 14 clubs in there, will ya?” First of all, don’t. That’s not your business. If someone is careless enough to go to the 1st tee with 15, they should get a penalty, not a heads up. One caddie I know summed up ALL of the above when he answered the official’s suggestion to count his clubs with this response. “I’m good. I do this every week of the year. It’s only you guys who do it once a year.” Ouch. 5. The course conditions were well discussed on Saturday, but after the crews watered the greens in preparation for the final round, Sunday played as a tough but fair test. Overall, how would you assess the test Shinnecock presented? Bamberger: A+. A great Open venue. Shipnuck: B+. It was perfect for the first two rounds, Saturday was messy, and Sunday it played a bit too easy because the USGA overreacted and put too much water on the greens and made the pins way too benign. Sens: To my mind, it looked and played very much the way a U.S. Open is supposed to play. Loved it. Marksbury: Rain, wind, fast greens, thick rough, fescue, false fronts, roll-offs, whining players and a winning score of one over...what more could we ask of a U.S. Open venue? A solid A in my book. Ritter: It's rugged, tough, gorgeous…a perfect U.S. Open venue. Can't wait to see it again in 2026. Dethier: The contrarian in me wants to take another side here, but this was a fantastic event with a compelling leaderboard and four distinctive days of storylines and impressive golf. Yesterday was terrifically fun; so was today, in a completely different way. The tough guys survived this week and I'm all in on Shinny. Passov: I'll say it again: Shinnecock Hills is the best championship course in the U.S. and a few suspect hole locations on Saturday won't make me change my mind. Wood: A. It’s the quintessential U.S. Open test, and I suspect it would have been just as good a test with a very similar leaderboard if you’d have just changed out the “Shinnecock” flags for “U.S. Open” flags any other four days of the year with no tinkering required. 6. Asked after his missed cut at Shinnecock Hills if he's convinced he win a major again, Tiger Woods said, "Absolutely." Did this week change at all how you feel about Tiger's chances in the remaining 2018 majors and beyond? Bamberger: I think Tiger will have to win some low key events — Sea Island, Greensboro, Honolulu — before he can think about winning a major. As he likes to say, "Baby steps." Can he? Of course. But the odds are way against him. Shipnuck: He's only an average driver of the ball and average putter. To win a major he'll have to simultaneously have his best week of the year on the greens and off the tee. That's a big ask. Sens: Well, it's good to hear him say that but it doesn't change my sense of his chances. Not impossible but the odds are vanishingly thin. There are just too many big numbers in the game he's playing these days to beat the best fields over four days on the most demanding venues. So now watch him go out and win at Carnoustie. Zak: I like to think I'm not susceptible to the one-week sample size for changing my mind...but I don't see him winning a major anytime soon, and that's a bit of a change of heart. In the grand scheme of things, this is far too early to make such a call, but his game just constantly works at 75-80%, occasionally lower, rarely higher. He'll need to be fully dialed in to beat the stellar field at a major. I just don't see him beating a stellar field. Marksbury: I'm with you, Sean. I always find myself in the rah-rah Tiger camp. But the best of the swagger and game we saw from him on the PGA Tour over the last few months didn't translate at Shinnecock. If he can put it all together, he might have a chance to win again. But he needs a lot more reps.
Ritter: I never thought he'd win a major this year and still don't. Bamberger has it right — winning a low-wattage event somewhere along the way would help get his nerves settled early in these pressure-cooker major weeks. Where will this low-key title happen? Hero World Challenge, December 2018, where Tiger Woods receives a trophy from tournament sponsor…Tiger Woods. Get your iPhones ready. Bastable: Augusta, 2019. Brace yourselves. Dethier: The razor-thin margin for error at Shinny Thursday and Friday didn't jive well with Woods's big misses. Yeah, he can win a major. But for now it won't be on a course this punishing. He doesn't belong among the favorites at the moment, but I'm not ruling him out for next month across the pond. Passov: I'm with Dylan, that the narrow margins crushed Tiger here. He struck the ball just fine on Thursday, but a chipping disaster at 1 and a terrible four-putt at 13 (which led to a wayward drive at the brutal 14th) were the source of his high scores. It wasn't missed drives or poor irons that caused that 78. Based on how he he was playing in March, and again at the Players, I still like his chances at Carnoustie and at Bellerive in St. Louis for the PGA. Bellerive is a lot like the courses where he kills it — Firestone, Torrey, Cog Hill — August 2018, he'll be back holding a major trophy. Wood: No, I still think he will win again, on both a Tour level and major level. I gotta figure he’s got a good 20-25 more good chances with health at majors, and I have to believe that the stars will align one of those weeks.